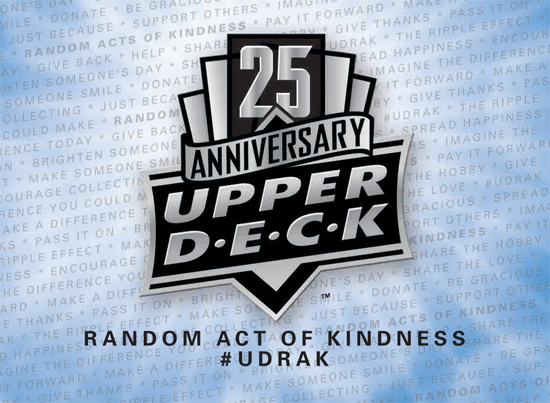 When Upper Deck first announced the company’s new Random Acts of Kindness program as a part of Upper Deck’s year-long 25th Anniversary celebration, collectors were buzzing about it. The program is designed to reward those individuals who give back to others, who are helpful and who make the hobby of collecting trading cards and memorabilia so much fun. Upper Deck began monitoring Twitter, Facebook, message boards, chatrooms and talking with industry insiders to begin compiling an ever-growing list of individuals worthy of a personalized mail day they would not be expecting. As these surprise packages began arriving, people started getting very excited. We are only a month into the program officially, but collectors are beginning to realize, if they do good, they may be rewarded for it. That being said, it is our hope here at Upper Deck that collectors will look to do good deeds because it makes them feel great and because it is the right thing to do. The opportunity for a surprise mail day would just be a cherry on top of an already excellent sundae. So Fedex arrived very early today, but I was not expecting a hefty box from Upper Deck. I opened the box with the Upper Deck Logo on it it says “Random Act of Kindness.” No idea what this is about, so I open it up and find some cool 25th Anniversary Promo stuff from Upper Deck: a pen, a little box cutter for busting boxes, a t-shirt and warm-up jacket. When I unrolled the shirt a team bag of cards fell out. I opened them up to find some 25th Anniversary promo cards and this for my personal collection! 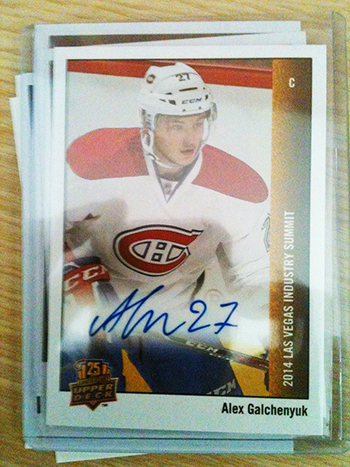 This Montreal Canadiens collector scored a rare Galchenyuk autograph card that any Habs fan would covet! 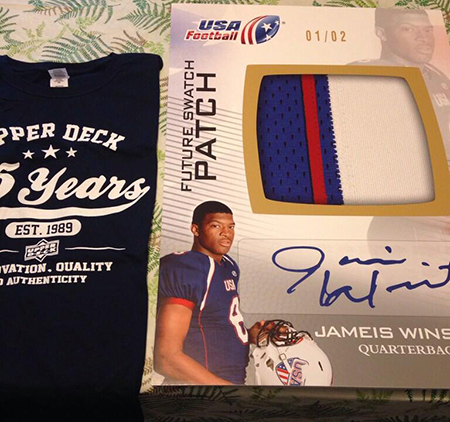 UD created a special blow-up card of Jameis Winston to share with one of his biggest fans! WOW. I am blown away @UpperDeckSports by the #UDRAK . Thank you so much!!! 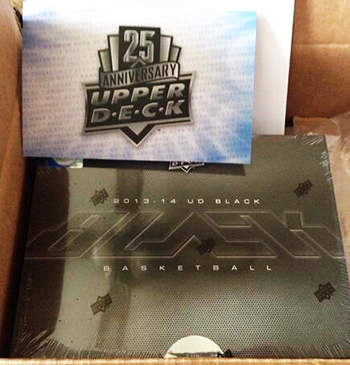 Jeffrey Detter was disappointed he couldn’t get any of the new Upper Deck Black Basketball, so when a free box showed up at his door he was shocked! There are some others who have received surprise mail days from Upper Deck who many would argue are just as deserving as the collectors above. The only thing really different about them is that they happen to be famous. 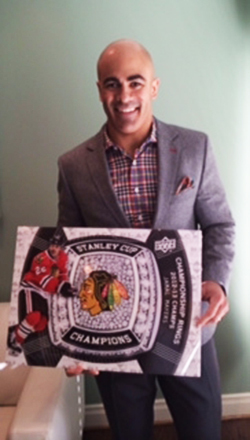 First up was a former NHL® player and now analyst for the NHL® Network; Jamal Mayers. He saw a collector bragging about a 2013-14 NHL Black Diamond Championship Rings insert of Mayers and he shared he would love to get one of the cards. Upper Deck went ahead and sent him a care package with some of those cards along with a special oversize version of the card. Jamal was all smiles upon receiving that surprise mail day. We supersized the Upper Deck card Jamal Mayers was trying to track down. Then there is actor, director and Hollywood icon Kevin Smith who has been a good friend to Upper Deck over the years. As an incredibly passionate Edmonton Oilers fan, we just had to hook him up with the new Edmonton Oilers Collection product when it was released. To say he was excited about it is a bit of an understatement. Gonna roll around in the contents of this @UpperDeckSports box like Suvari in AMERICAN BEAUTY. 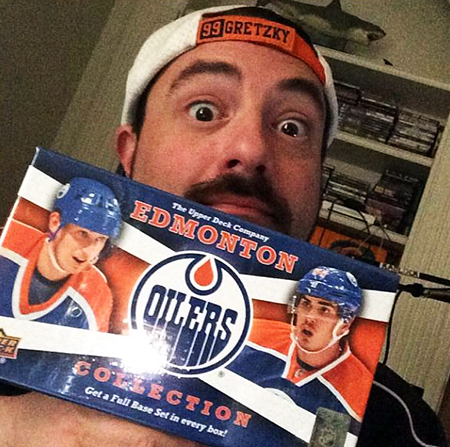 Kevin Smith is a great guy and a great fan so of course it is fun to share items with him from the team he loves. 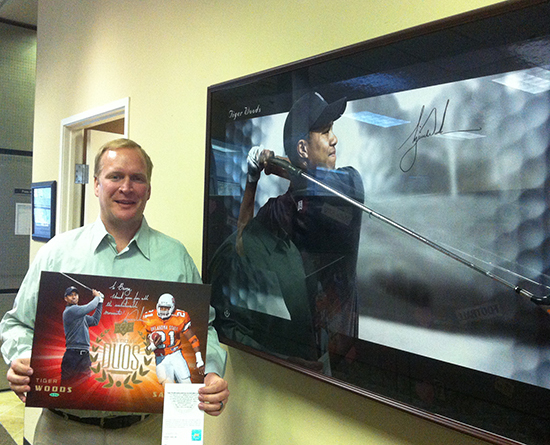 Upper Deck’s Marketing Manager shows off a special Upper Deck Random Acts of Kindness piece for Barry Sanders that Tiger Woods signed and inscribed to him. And lastly you have a situation where both the athlete and the collector mix. Michael Doffing is a die-hard Ken Griffey Jr. collector who we recently featured here on the Upper Deck Blog for his birthday. Knowing how much Doffing enjoys Griffey and also knowing how much he has given back to fellow collectors over the years made him a perfect candidate for the Upper Deck Random Acts of Kindness promotion. We had Ken sign a personalized blow-up card to Doffing and sent it off to him along with some other limited-edition collectibles and promotional items we knew he would enjoy. We enjoyed reading his excited post on Facebook where he shared his excitement about receiving this unexpected package. 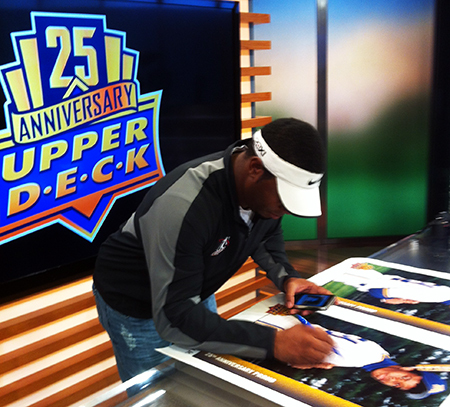 Ken Griffey Jr. signed a special 25th Anniversary blow-up card specifically for one of his biggest fans for Upper Deck’s Random Acts of Kindness program. If this shows fans anything, it is to expect the unexpected with Upper Deck’s Random Acts of Kindness program. You don’t know when we will strike or where, but if you end up receiving a package with this special sticker on the outside, odds are you are in store for something you will thoroughly enjoy as we work to thank all those fans who helped make this such a memorable 25-year run for Upper Deck! Awesome! Love the Barry Sanders story! That is some of the coolest stuff I have ever seen. That is what makes you guys number 1 in my book. I am a longtime collector and upper deck has always been my favorite. Not only because MJ is the premier athlete but because of the products put out. I have always loved the cards from day one. I still have 1 unopened box of 91-92 basketball that I hung onto, as hard as that was for me at 17. This weekend I was showing my 9 year old son my julian wright and MJ collections and to his delight have him a couple of my duplicates of both. The look on his face was the same I still get to this day when opening cards. It’s much harder now since I have a family, but the ones I do get are always upper deck. Nothing but the best even if it’s just a pack! Keep up the great work and wonderful products! I would love to be rewarded for an act of kindness, what do I need to do? Way to give back guys! Keep up this great promotion! I’ve donated most of my cards (not just base) to my little brothers sports teams and they have a blast reading stats and swapping cards! Thanks UD! You bring joy to everyone! On card at a time 🙂 and happy 25th anniversary!